Antibiotics are often an essential component of the therapeutic plan that is developed to improve the clinical course of a patient. Typically, certain antibiotics are better for a given clinical condition. Allergies to these antibiotics, however, may limit the use of these antibiotics and in certain cases may complicate the course of optimal care. Allergies to antibiotics have become an great hindrance to the clinician. Today, especially in the context of the diagnosis of HIV, certain drugs, which are considered to be drugs of choice, are very necessary. However, their use may be contraindicated in certain patients because of a pre-existing allergic reactions to these antimicrobials. One approach to using antibiotics in potentially allergic patients is to initiate a desensitization protocol in these patients. An allergic reaction can be classified into one of four categories. A Type I hypersensitivity reaction can be life threatening and is usually referred to as an anaphylactic reaction. This reaction is initiated once an antigen is formed. Following identification, one's body initiates a cascade of reactions that lead to anaphylaxis. Types II and III reactions are initiated by IgG. These reactions are generally more delayed than the Type I reaction and will not cause immediate death. The Type IV reaction is the mildest and can be managed without discontinuation of the offending agent. Sullivan et al have successfully desensitized all of the patients that they attempted to desensitize to this class of antibiotics. Others who have used their protocol have also had a high success rate. 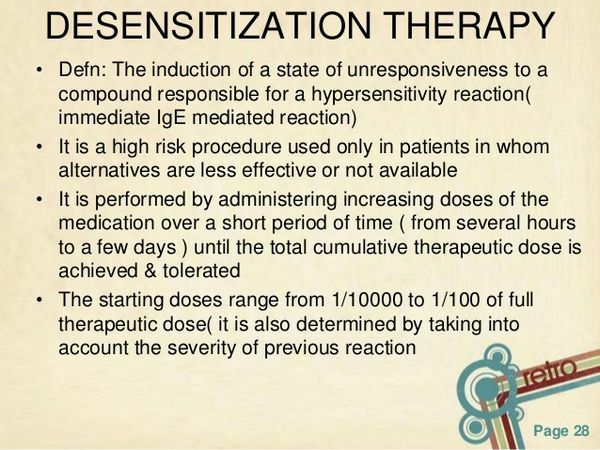 The protocol involves the initiation of therapy with the offending agent at very small oral doses and then doubling the dose every fifteen minutes until a predetermined number of units are administered. Once this has been accomplished, the dosage form is changed to the intravenous route until the desired dose is reached. Trimethoprim-Sulfamethoxazole (Bactrim, Bethaprim, Cotrim, Septra): Patients can be desensitized to trimethoprim-sulfamethoxazole in a similar manner. In one study performed by Gluckstein and colleagues, a 10-fold serial dilution was used. Nineteen patients of 22 were successfully desensitized. The remaining three patients experienced nausea and/or chills, which necessitated discontinuation of the desensitization regimen. Fourteen of the patients who were desensitized tolerated this drug for a mean of 14 months at which point therapy was discontinued for reasons other than an allergic reaction. Because there is no satisfactory alternative to vancomycin (Vancocin), it is very important to desensitize patients. An existing protocol includes the use of six stock solutions, each having a different concentration. A solution with increasing drug concentration is administered every 15 minutes. Desensitization can last from anywhere between two hours to several days. Experience with the desensitization of persons who are allergic to this class of antibiotics is limited. Earl et al successfully desensitized one patient. They began initiating the drug at a very low dose and then doubling the dose every 30 minutes until a final therapeutic dose was reached. 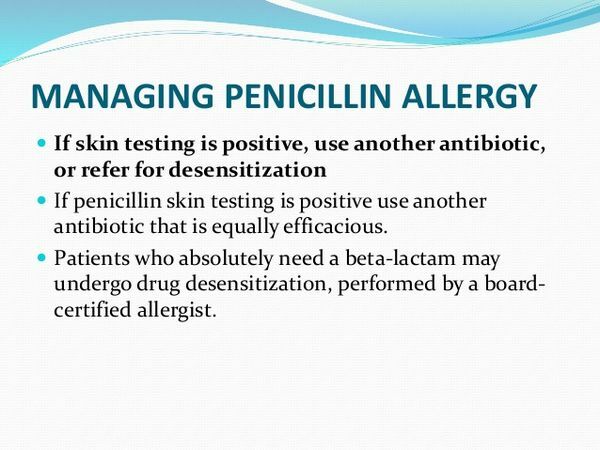 Desensitization of patients who have allergies to pentamidine (NebuPent) also involves the use of serial dilutions. There are two reported cases both of which were successful. There is one reported case of clindamycin (Cleocin) desensitization by Marcos and colleagues. They initiated an oral regimen at 20 mg every eight hours. The dose was doubled every day until the therapeutic dose of 600 mg was reached. Desensitization can be a very valuable tool. Certain clinical conditions require the use of a certain antibiotic for which no alternative may be available. Allergic reactions to that compound may significantly compromise the level of care that is provided to the patient. Alternatives to the drug of choice may not be as effective as the initial option. In these situations, the use of a desensitization protocol may be inevitable.